I started with 3 white 2"x2" cardstock squares... I inked 2 of them using my stencil & inks & stamped my sentiment from My Valentine stamp set on the 3rd one. Then I proceeded to mount them on slightly larger black & white cardstocks. 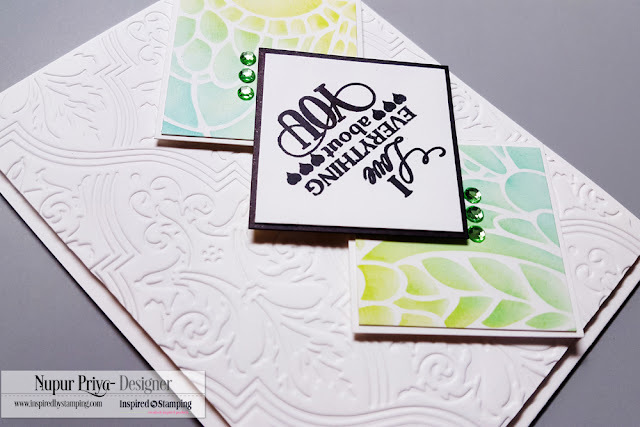 I used an embossing folder to emboss the background & then arranged & adhered everything down on an A2 card base. I added few rhinestones for the much needed bling in this simple card.